If you knew that your drinking water was contaminated with uranium, what concerns would you have? If you thought of “radioactivity,” you are certainly not wrong. 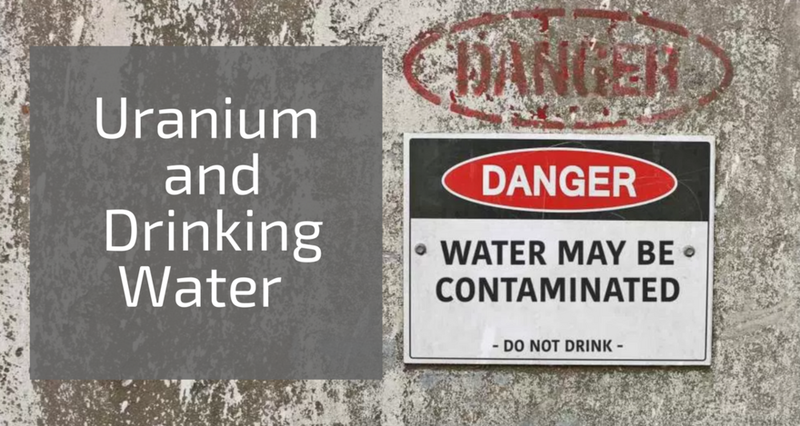 However–despite popular belief–the dangers of uranium contamination in water mostly come from the toxic chemical effects of the heavy metal accumulation. We, at SimpleWater, have created a quick guide to explain the concerns of uranium contaminated water: where it comes from, what to look for, and what you can do about it. Uranium is a naturally occurring metal. It the heaviest element present in the natural environment and can be found in rocks, soil, water, air, plants, and animals. Because uranium is ubiquitous in the environment–albeit in varying concentrations–some exposure to the heavy metal is inevitable. Uranium exposure can result in both radiological and chemical toxicity, but as we mentioned, heavy metal toxicity from uranium is of greater concern when we’re talking about tap water. While most ingested uranium is excreted by the body (via urine and feces), small amounts can be absorbed and carried through the bloodstream to internal organs. Scientists call this bioaccumulation. Uranium toxicity can affect various organs and bones, however no organ is more sensitive to uranium than the kidneys. When uranium in the bloodstream is filtered by the kidneys, the compounds can cause (sometimes severe) damage to the organs’ cells. At low concentrations (below 25 µg), kidneys are able to repair themselves over the course of several weeks. This is (generally) the only symptom. At high enough intakes (50 to 150 µg, depending on the individual), uranium toxicity may cause acute kidney failure–and subsequently death. (Note: bathing or showering in water that contains uranium has not been demonstrated to be a health concern). Unlike many chemicals of concern, uranium does have maximum contaminant levels set by the U.S. EPA under the Safe Drinking Water Act. Maximum Contamination Limits (MCL) set the limit for contaminants based on economic feasibility of treatment and health impacts, assuming that a person drinking two liters of water per day, for 70 years. What Can Private Well-Owners Do About Uranium Contamination? If you’re on a public water supply, you can check consumer confidence reports for your water system tests. Of course, you can also get a personalized water quality report for your well or city water by using TapScore’s Advanced Well Water and Advanced City Water tests, which tests for Uranium amongst 30 other heavy metals and other important contaminants. Older PostWhat's in Your Raw Water?